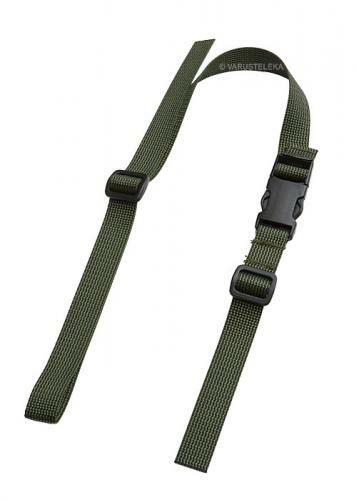 A simple but rather clever two piece utility strap, doubles up as a weapons sling, carrying strap or sternum strap. Modular construction, attaches to any rucksack or PALS gear and doesn't fall off even if you're in a hurry and forget to secure the buckle. 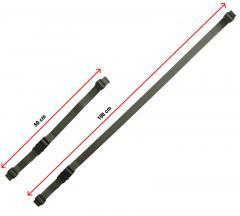 Adjustable at three points so you'll never have to roll and tidy up the ends. This strap consists of two parts, each has a buckle on it to form a loop that can be attached onto just about any rucksack or PALS gear. The clever thing is that this allows for the strap to stay securely in place even if you leave the buckle open, and having three points (the two ladder buckles and the SR buckle) of adjustment you don´t need to worry about long webbing straps flopping all around you. Available in two lengths, the shorter one is great for rain ponchos and the like whilst the longer can be used to strap larger items such as sleeping bags and mats onto rucksacks. Utility strap for lashing sleeping gear etc. onto rucksacks and vests. This is probably the most common use for a strap like this, in this use this design often outperforms the usual sinlge piece tie-down straps. A carry strap for a bag, by attaching this onto a bag (might require additional clips for compatibility) you get a simple quick-release shoulder strap for just about any bag. 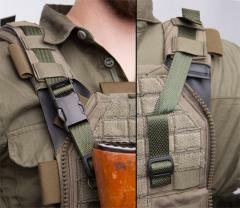 One point weapon sling, yes this can even be used as a simple tactical sling. 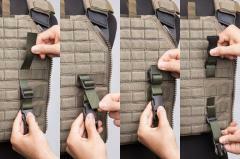 For this you need the longer 100 cm strap, attach the long part onto the back of a vest or plate carrier and the short piece onto your weapon (adapters such as clips, hooks or paracord loops are easy to attach to the end of the strap). The end result is a a very simple, very cheap one point sling witch quick release! Sternum strap for a rucksack, just loop the ends onto your shoulder straps and there you go, a damn simple and rugged sternum strap for stability! And the list goes on and on, really the only limit being your fantasy! These are made from the very same materials as the Finnish army M05 combat equipment. 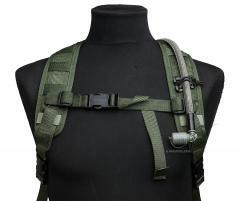 The straps are high quality polyamide webbing and all buckles are made by ITW Nexus. Everything is naturally MILSPEC stuff with necessary NIR reflecting capabilities etc. 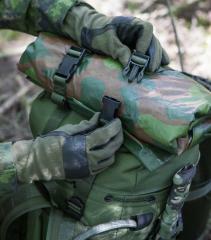 These are made in Estonia by Finn-Savotta Oy, our subcontractor for all Särmä TST field gear. Materials are cut and prepared in Finland, assembled in Estonia. This is because of two reasons: first of all Finn-Savottas production schedules are so packed full of huge military orders that we'd have to wait months to get these sewn in Finland. The second thing is that this way we can cut the retail price by a third! Quality wise these are the same as Savotta's Finnish sewn stuff, so no worries there.